Yes, Pajama Day is very American. It originated in the American tradition of having “Spirit” days at schools – many schools have one a month, of various silly themes, like backwards day, crazy hair day, dress-up as your teacher day, etc. The idea behind spirit days is to give students a chance to be creative well as to build community by all taking part in something different, while not altering the schedule of the day. We understand that too many activities like that can be cumbersome and lose the point, so we have limited it to a tried and true favorite. 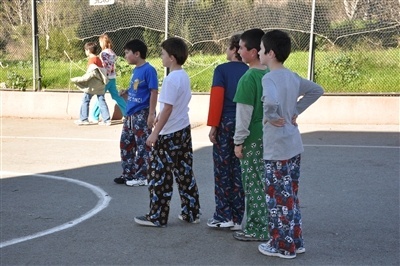 Not all of our global citizen community at ISTP embraces Pajama Day, but I can tell you that the elementary school students love it. It is a chance to do something silly and different while still going about the daily life of learning at school. It is a chance to share something that feels personal, yet is simple and not threatening. It is yet another way that we can take a moment to alter our perspective and look at the world through a different lens (or different clothes). 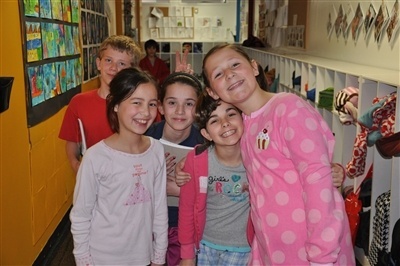 Yes, I will admit that I love it in part because I am cozy and comfy all day, but I also love the face-covering smiles of the students as they see their friends and teachers in various robes, jammies, and slippers. I love passing out hot chocolate and the thrill that the students have in sharing a special treat of a simple warm beverage. These moments do build community, as I experienced firsthand with all of the smiles, conversations, hugs, and heartfelt thank-yous I received yesterday.